CALIFORNIA BREED’s self-titled debut album has been Nominated for ALBUM OF THE YEAR at this year’s Classic Rock Awards. The 2014 Classic Rock Roll Of Honour takes place on Tuesday, November 4, at The Avalon, Hollywood, USA. But, of course, we couldn’t do any of this without your help. We may have come up with the nominations shortlist, but the final decision as to who will win rests with YOU. So please cast your votes now, and get involved. Rock that vote! Hosted by UK-based Classic Rock magazine, the 10th annual Classic Rock Awards–the Classic Rock Roll Of Honour presented by Orange Amplification–announced today a stellar line-up of live performances from some of the most exciting and respected artists in rock: Kings Of Chaos, California Breed, Rival Sons and Scott Weiland & The Wildabouts. This star-studded list of performers will be joining an already announced list of rock icons to be on-hand at the all-star event on November 4 at the Avalon in Hollywood, CA including: Sammy Hagar (this year’s host), Gregg Allman (this year’s Living Legend Award recipient) and guitarist Robby Krieger and drummer John Densmore of The Doors (this year’s Inspiration Award recipient), and many more. Kings Of Chaos, the part-time, all-star rock’n’roll collective, are one of the most exciting live bands in rock for two distinct reasons: 1. The a-list revolving door of guest performers; and 2. The bands core line-up of Guns N’ Roses’ Duff McKagan, Matt Sorum and Gilby Clarke alongside guitar aficionado, Extreme‘s Nuno Bettencourt. It’s a combination that brings anticipation and killer live performances in abundance. For this intimate live performance, Kings of Chaos will be joined on stage by Sammy Hagar, the evening’s host and frontman of Van Halen, Montrose and Chickenfoot; former Deep Purple and current California Breed frontman Glenn Hughes; and more rock royalty, Def Leppard‘s Joe Elliott and Phil Collen; and one of the most recognizable and important figures in rock, Billy Gibbons (ZZ Top). 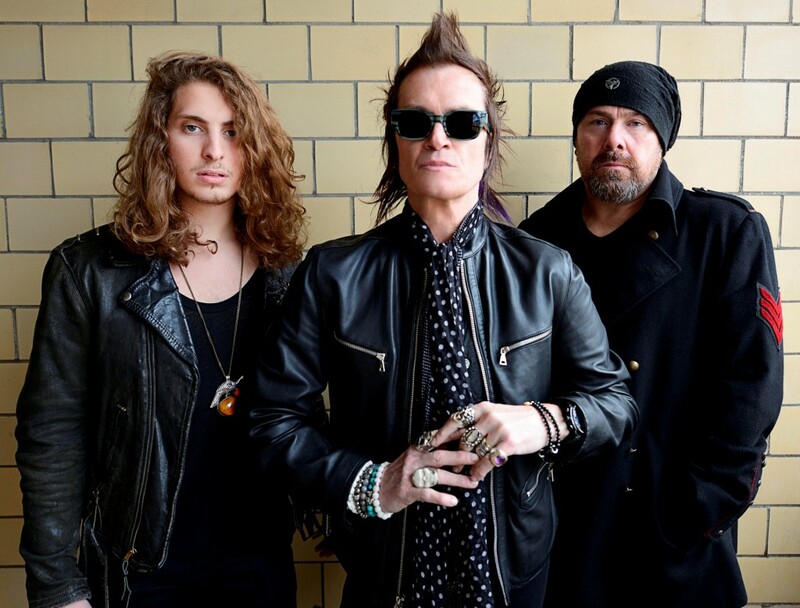 As well as performing with the aforementioned Kings of Chaos, Glenn Hughes will also be playing a stripped-back set with his current band California Breed, with 23-year-old newcomer guitarist-singer-songwriter Andrew Watt. Rival Sons have seen a meteoric rise in international recognition since their inception in 2009. Playing to thousands in sell-out shows around the world, this will be a unique performance in front of hundreds of their peers. Scott Weiland, notorious frontman of Stone Temple Pilots and Velvet Revolver, brings his new band, Scott Weiland & The Wildabouts, to perform their acclaimed live show to this star-studded audience. The Classic Rock Roll Of Honour awards will air on AXS TV, December 28th @ 9:00PM ET / 6:00PM PT. GLENN HUGHES (California Breed, Black Country Communion, Deep Purple, Trapeze) has contributed THE POLICE classic song, “Roxanne“, to the ROCK AGAINST TRAFFICKING project formed by record producer and musician, Gary Miller, to raise awareness of the global slave trade. Glenn Hughes went in studio recently with popular record producer, Gary Miller, to record the track to add his voice to the all star celebrity roster. When asked about his contribution to the project, Hughes shared, “Gary called me and told me about the project and asked if I would sing a song. He asked me about doing ‘Roxanne.’ There is so much love involved in bringing this special project to the world. It is indeed my pleasure. You can read more about the project and listen to “Roxanne” by GLENN HUGHES via Billboard.com. Other artists committed to the project and who have contributed tracks include SLASH and FERGIE (“So Lonely“), Journey’s NEAL SCHON and ARNEL PINEDA (“Synchronicity 2“), HEART (“Wrapped Around My Finger“), JULIAN LENNON (“If I Ever Lose My Faith“), American Idol alumnus DAVID COOK (“Message in a Bottle“), EN VOGUE (“Brand New Day“), STEVE LUKATHER and LEE RITENOUR (“Shape of My Heart“), former Yes frontman JON ANDERSON (“Every Little Thing She Does is Magic“), PAUL CARRACK (“Let Your Soul Be Your Pilot“) and former Free bassist ANDY FRASER (“Every Breath You Take“). CARLOS SANTANA, JOSS STONE and KEB’ MO’ are also on board, but have not yet finalized their tracks. GLENN HUGHES will be a featured guest on the new Eddie Trunk Podcast, available Worldwide on Thursday, August 14th, 2014. Also joining them are CALIFORNIA BREED guitarist, ANDREW WATT and record producer, DAVE COBB. The interview took place in New York on May 30th, 2014.